Dianne graduated from Michigan State University is 2000 with a degree in Parks and Recreation, Natural Resource Based Management. While in school, Dianne had a successful swimming career as a captain and four-time top 16 finisher at the Big Ten Championships finishing her career at the 2000 Olympic Swimming Trials. After graduating, Dianne pursued a career as a law enforcement park ranger for the National Park Service but could not stay away from the pool for very long. Dianne started her coaching career with a “lunch bunch” in Traverse City. That group developed into a dedicated group of swimmers competing at different levels including Masters Swimming, Ironman Triathlons, and many local triathlons and open water events. Dianne got the opportunity to return to her almamater and coach at Michigan State during the 2008-2009 collegiate season. 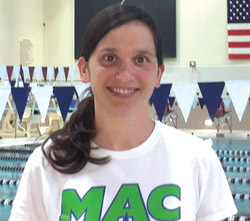 Her passion for coaching was fueled and after moving to the Brighton Area with her family in 2012, she quickly got involved with the Milford Athletic Club. Starting as an assistant coach in 2013 and then taking over as head coach in January 2014. When not on the pool deck Dianne spends time with her husband, Phil, their three young children, Ethan, Max and Adeline, and two German Shorthair Pointers Morgan and Griffey. Her family enjoys all outdoor activities including swimming, hiking, and traveling and watching Michigan State Athletics.